The VAO is providing dogs for the Camden County program, which saw its first graduation last week. Officer Dennystor Nieves of the Camden County Correctional Facility stands with rescue dog Cinnamon and inmate Scott Ryan after a small graduation ceremony at the facility last week for a new program in which inmates train rescue dogs to be adopted by veterans. Mt. Laurel’s One Love Animal Rescue is one of the groups providing dogs for the program. 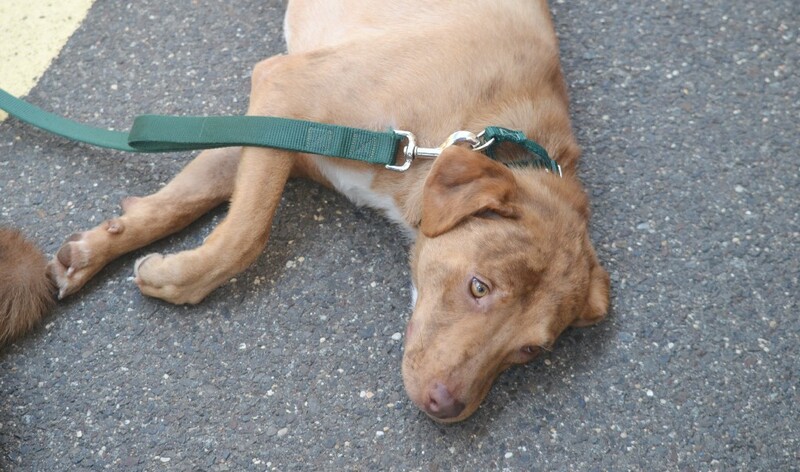 Veterans will soon find four-legged friends, and dogs will find forever homes as part of a new pilot program in Camden County that has inmates train dogs from rescues in Voorhees and Mt. Laurel as companion dogs for veterans. 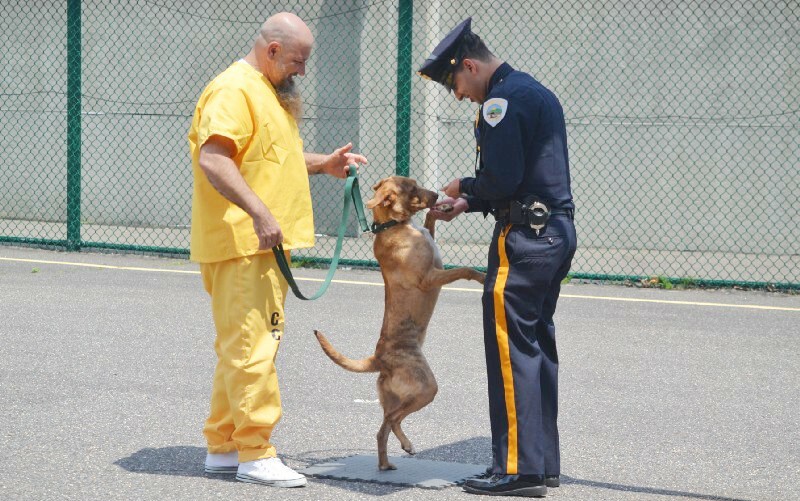 Camden County officials last week held a graduation ceremony at the Camden County Correctional Facility that saw three dogs graduate from the first class of the program after having undergone companion training with inmates at the corrections facility for the last three months. The idea for the program stemmed from a meeting state Sen. James Beach had with a New Jersey veteran who received a service dog from Ohio since New Jersey had no program to train dogs to help with the needs of veterans such as depression and PTSD. Beach later met with Camden County Freeholder Jonathan Young, who serves as liaison to the Corrections Department, and eventually the Camden County Correction Facility “Friends 4 Vets” program was born. Speaking at the graduation ceremony, Young described the program as a “win-win-win,” in helping veterans, dogs in shelters and the rehabilitation of inmates. “How we measure this program and the success of this program is how all three come together and become successful,” Young said. Also helping with the program has been Marissa Corbett of Above & Beyond Dog Training, who works with the inmates twice a week, along with dogs provided by Mt. Laurel’s One Love Animal Rescue and the Voorhees Animal Orphanage. In addition to lessons Corbett provides, the inmates live with dogs at the jail as they complete 180 hours of training within 12 weeks, including writing journals, reviewing training-related reading materials, practicing drills and taking the dogs with them through some of their daily life at the facility. Corbett said the corrections facility staff and inmates have all worked hard to accommodate the program and work toward a successful launch. “I was a little bit worried that the program wasn’t going to gel as well as it has, but it’s been very fluid. The guys really love it and they’re actually really good handlers, which has far exceeded my expectations,” Corbett said. 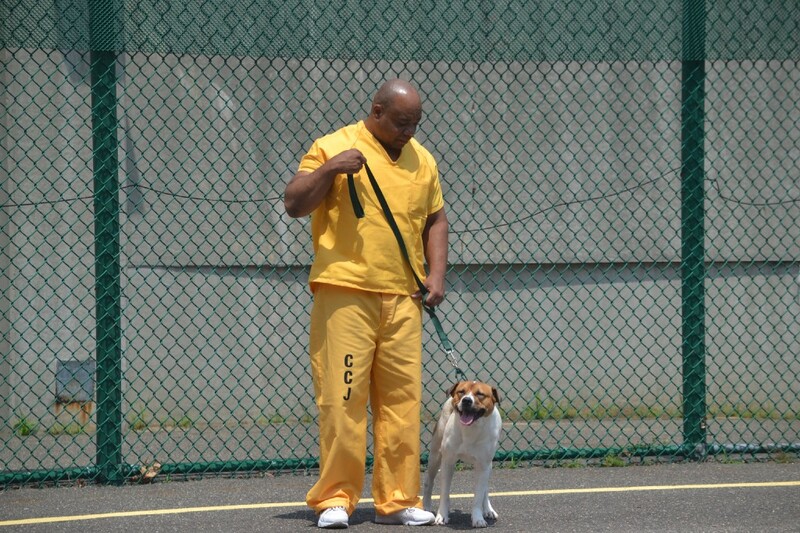 Inmate Darren Hardison of the Camden County Correctional Facility stands with rescue dog Duchess and after a small graduation ceremony at the facility last week for a new program in which inmates train rescue dogs to be adopted by veterans. Mt. Laurel’s One Love Animal Rescue is one of the groups providing dogs for the program. Inmate Darren Hardison, who worked with a graduating dog named Duchess, said the program has helped him keep productive these last three months, with the dogs helping him as much as he’s helped the dogs. Sherri Smith, of the Mt. Laurel-based One Love Animal Rescue, said all of the inmates have far exceeded the group’s expectations. “The guys are doing time, but are no longer wasting time. They are learning a new skill and can take pride in the fact that they are making a difference in the lives of veterans in need,” Smith said. Also at the ceremony was Vietnam War veteran Arthur Wimberly Jr., a Pennsauken man who was selected by the Camden County Office of Veteran Affairs as the first recipient of one of the graduated dogs. Cinnamon relaxes before her graduation ceremony. Wimberly served in the U.S. Army during the Vietnam War, entering active service in January 1968 until he was released at the rank of sergeant in January 1971. Although Wimberly has yet to select which dog will best fit his home and lifestyle, he said he and his wife were looking forward to loving a new friend and being loved back. “Depression is one of those things that just comes about, along with PTSD and things of that nature, but it (having a dog) will just give me more to do, with another reason to get up and another reason to do more,” Wimberly said.